James T. Berger, Principal of James T. Berger/Market Strategies, LLC, now offers businesses corporate research services. His distinctive competency focuses on developing, managing and evaluating Internet surveys. Berger combines the real-world, practical orientation of a professional business person combined with the theoretical knowledge of an academician who has taught college students for more than 30 years. Currently a faculty member at Chicago’s Roosevelt University, he teaches courses in Market Research, Marketing Management, Strategic Marketing, Selling and Sales Management, Consumer Buyer Behavior and Retail Merchandising and Control. Corporate research surveys, including research design, creation of a research protocol, analysis and interpretation of data. Surveys to test consumer reactions to actual or planned corporate policy initiatives. Assessing damages when brand equity has been diminished or diluted. Survey research focusing on product and process improvement. 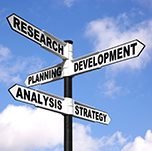 Research to test feasibility of acquisition, divestitures and/or diversification strategies. Research on the valuation of intellectual property for brand acquisition, divestiture and licensing purposes. Gathering information to support or deny allegations with respect to trade secrets.